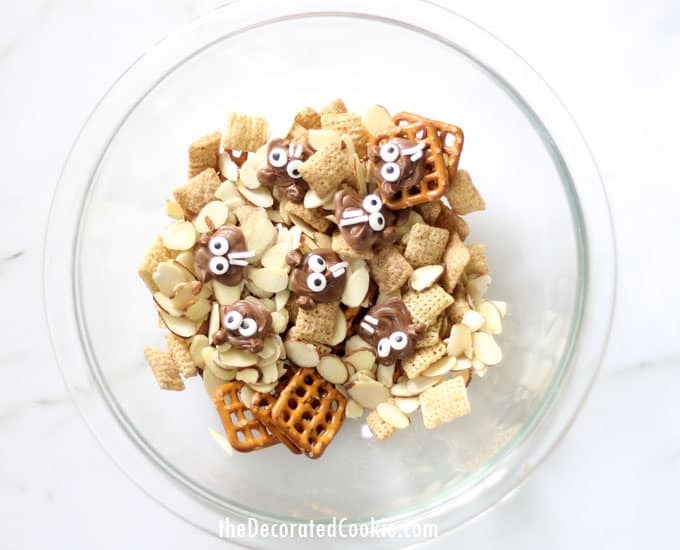 This groundhog day snack mix is a cute and fun food idea to give and eat as you wait to see if the groundhog sees his shadow. 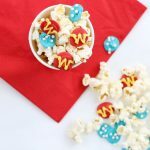 Great classroom treat idea! 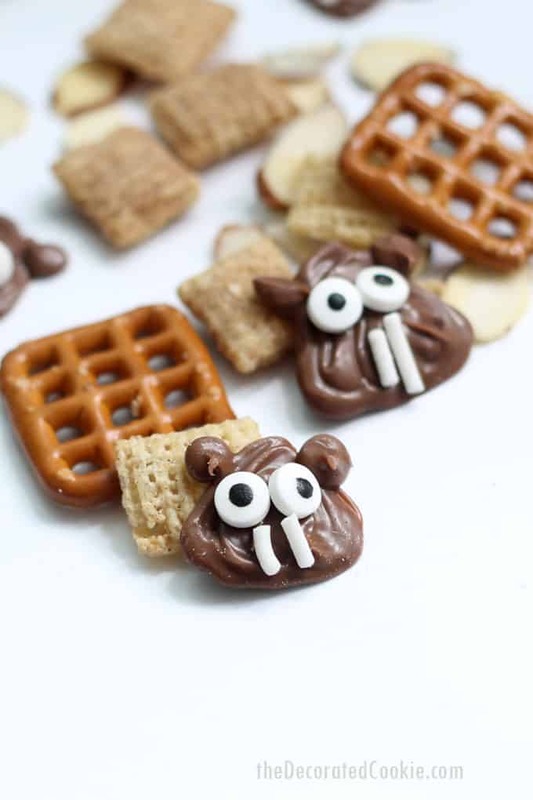 If you have any kind of celebration around groundhog day, or if you just want to make a silly, fun snack for the kids (these make a great classroom treat, too), here is some simple groundhog day snack mix. 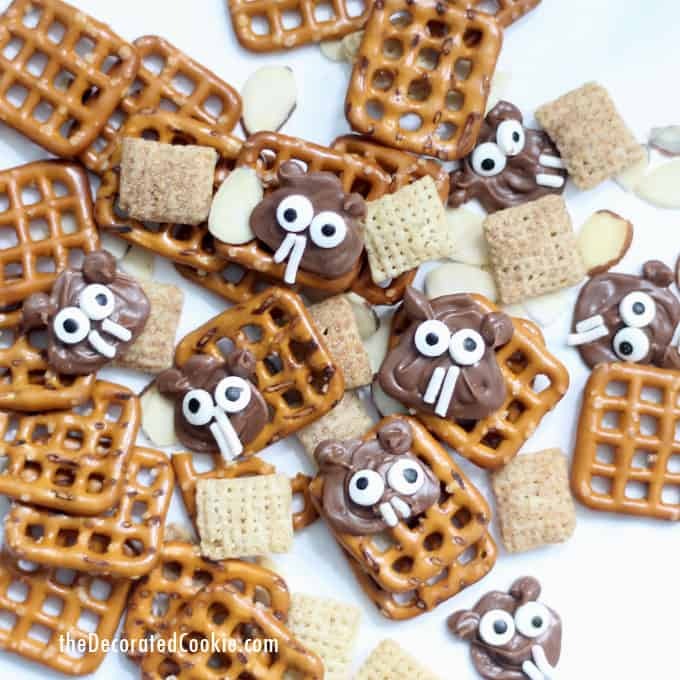 I’ll show you how to make the chocolate groundhogs, but feel free to use any snack mix-ins you like. Do you put much stock in the groundhog to determine how long winter will last? 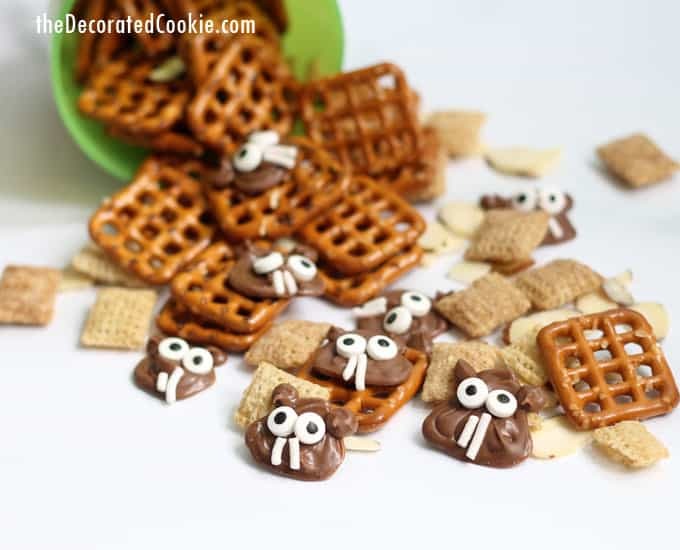 For those outside of the US and Canada unfamiliar with this odd “holiday,” I’ll just copy and paste my description from my other groundhog-themed post, a roundup of 12 fun food ideas for Groundhog Day: For those elsewhere in the world, Groundhog Day is an American “holiday” (using that term loosely) that falls on February 2nd, during which we are given the definitive answer as to whether or not winter will continue for six more weeks or spring will arrive early. It’s based on a scientific analysis of weather patterns… nah, just kidding. It’s based on the Pennsylvania Dutch superstition that if a groundhog pops up on this day and is startled by his shadow, he escapes back underground for six more weeks of winter. The most popular celebration takes place in Punxsutawney in central Pennsylvania. They do it up pretty big there. *Find most of the above at the craft store. I used a rainbow sprinkle mix and laboriously picked out the white ones. Line a baking tray with parchment or wax paper. 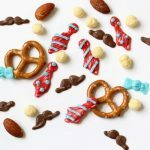 Melt the chocolate chips or candy melts according to package directions and pour into the decorating bag. Note that if you’re using candy melts (as I did here), you can melt directly in the decorating bag. Chocolate will be hotter, so use caution when handling the bag. Snip a bit off of the tip. Pipe a rounded triangle shape for the head and two little ears. 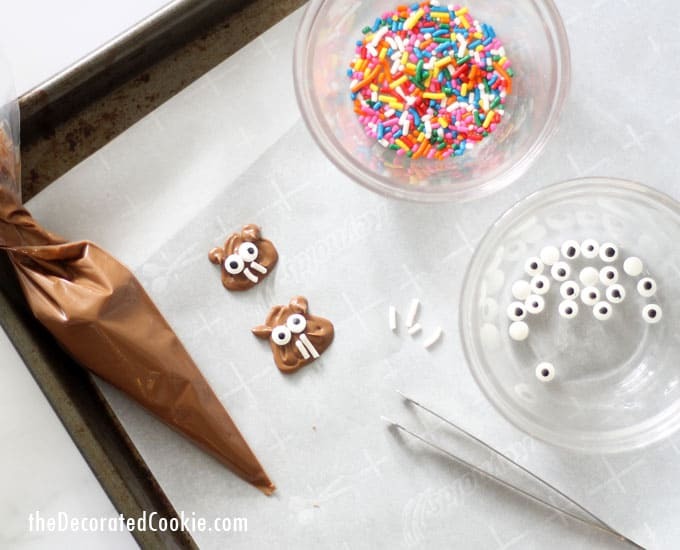 Use the tweezers to add two eyes and two white sprinkles for “teeth.” Note that candy melts harden relatively quickly, so you should pipe one or two heads and immediately add the eyes and teeth. Chocolate takes a bit longer to set, so you have more time. Let the groundhogs set well. Candy melts can set at room temperature for about 30 minutes. Chocolate can be chilled to set more quickly. 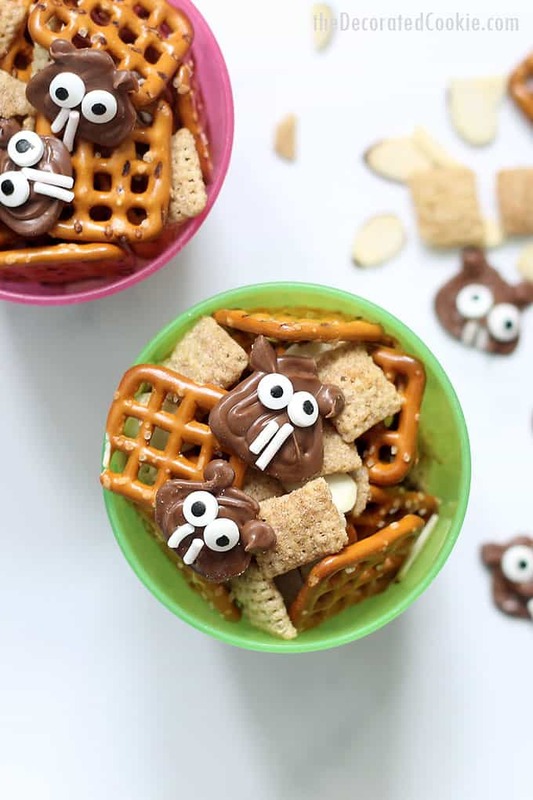 In a bowl, mix together and snack you like (pretzels, cereal, nuts…) with the chocolate groundhogs. Line a baking tray with parchment or wax paper. Melt the chocolate chips or candy melts according to package directions and pour into the decorating bag. Note that if you're using candy melts (as I did here), you can melt directly in the decorating bag. Chocolate will be hotter, so use caution when handling the bag. Snip a bit off of the tip. Pipe a rounded triangle shape for the head and two little ears. Use the tweezers to add two eyes and two white sprinkles for "teeth." 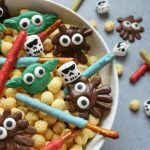 Note that candy melts harden relatively quickly, so you should pipe one or two heads and immediately add the eyes and teeth. Chocolate takes a bit longer to set, so you have more time. Let the groundhogs set well. Candy melts can set at room temperature for about 30 minutes. Chocolate can be chilled to set more quickly. 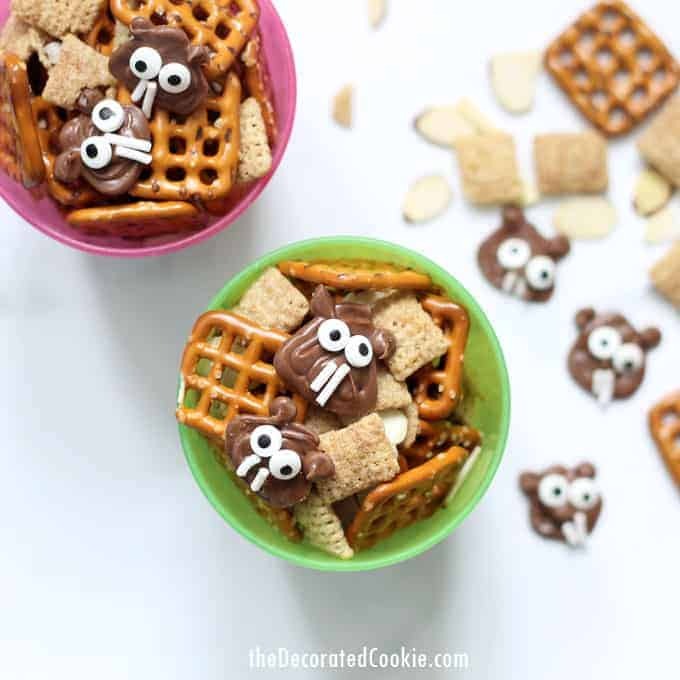 In a bowl, mix together and snack you like (pretzels, cereal, nuts...) with the chocolate groundhogs.